The University of Connecticut’s (UConn) UTC Institute for Advanced Systems Engineering (UTC-IASE) Associate Director of Academic Programs, Amy Thompson, was recently elected as the Vice President of the International Council of Systems Engineering (INCOSE) New England (NE) Chapter. Ebad Jahangir from UTRC was elected as the Secretary, Matt Tkac from CS Communication Systems was elected as President, and Ed Medri from Corindus Vascular Robotics was elected as the Treasurer. INCOSE is a non-profit membership-based organization, that has dedicated it’s work since its founding in 1990 to advancing the field of systems engineering and to connect systems engineers from around the globe through a united and professional network. The main objective for INCOSE NE chapter will be to help bridge together systems engineers from all over the region across multiple different fields and domains such as energy, transport, aerospace, aviation, marine, defense, and healthcare. In conjunction with these objectives, INCOSE NE is specifically equipped to meet this objective due to the wealth and variety of industry, academic, and professional-based specialties and resources that are located within the northeast region from Connecticut to Maine. The chapter currently has 160+ systems engineering members across six states. The new INCOSE NE leadership team hopes to build and sustain an invigorated atmosphere for professional growth for systems engineers and to create a strong network of resources to support the chapter in achieving their professional and organizational goals. The chapter will be (1) planning new learning opportunities, professional networking, and social networking events that will attract new members and bring-out existing members; (2) developing resources locally within the states to support local events; (3) building a network across the region with a focus on industry and business diversity; (4) working with chapters outside of the region to bring resources and value into the region; (5) instilling a renewed focus on education and workforce development; and (6) attracting engineers early in their career to get them interested in the work that INCOSE does. The new INCOSE NE leadership held its first meeting on May 17th, 2018. (https://www.neincose.org/events/incose-new-england-membership-meeting-hartford) This was a multi-site meeting, which connected the new UConn-Hartford Campus site to another host site in Waltham, MA, as well as the guest speaker, David Long, and other remote viewers who could not attend in-person. At the first meeting, the new officers were introduced, a member feedback session was conducted to gauge what INCOSE NE members wanted to see from the chapter in the upcoming year, and a presentation was given by David Long, who is a past INCOSE President. Long’s presentation focused on his view of the field and discipline of systems engineering, and what we have to do as systems engineers to define and refine our roles and discipline in the development of future highly-connected, complex systems. Long proposes “the Engineering of Systems” vs. “Systems Engineering,” as a better perspective on what SE’s do. 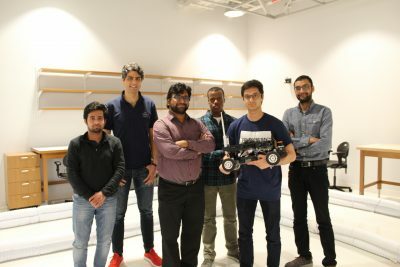 For more than a year, Dr. Sridhar Duggirala, an assistant professor in the Computer Science and Engineering Department at the University of Connecticut, and his students worked on building an autonomous model racing car F1/10. The UConn team participated in an autonomous vehicle racing competition that took place at Cyber-Physical Systems week in Porto, Portugal. In its first time in real competition, the car won 2nd place, with a lap time of 11.50 seconds. The F1/10 competition is centered around creating an educational and challenging design experience for students from around the world. The competition consists of designing, constructing and testing an autonomous 1/10th scale F1 model race car, that is capable of achieving speeds upwards of 40 mph. The components of the car, such as the design of the car, the required hardware, and the bill of materials were all provided by the competition organizers. “Building the hardware for an autonomous vehicle is a long and tedious task” (Duggirala, 2018). “Additionally, it does not answer the most interesting aspect of the autonomous technology, which is the software” (Duggirala, 2018). 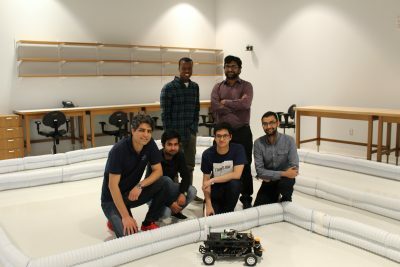 He said that the organizers provided the design and the bill of materials to help teams’ focus on the software aspect of the autonomous vehicle, and most of the team’s time was spent on designing the software and performing testing and iteration. One of the most important design mechanisms in the team’s vehicle was the Lidar technology component. This technology is used to create a visual image of their surroundings by detecting when there is an object in front of them. It then sends this information along with the visual field image to the processors, which then directs the car to avoid the obstacle in the way. Lidar technology is useful in sensing the surrounding environment and provides a very high quality resolution image of the surrounding environment. It also provides a very accurate estimate of the distance of the Lidar from a given object in the environment. The processor is the one component that takes all the inputs from the environment and the external sensing devices, such as the Lidar mechanism. Some of these inputs include distance of the car from walls and surrounding obstacles, which are then give instructions to the car to determine certain factors such as its speed and steering angle. “It took us around 6 weeks to build the car.” he said. “However, testing the car was the most challenging part and it took us around 8 weeks to come up with the current controller that we have in place” (Duggirala, 2018). The team used several phases in their design process to produce the software controller design that was seen in the final product. The first phase was to develop the controller mechanism that steered the car in the right direction, that is, the direction away from all the obstacles in the car’s way. Secondly, the team developed a speed controller part that used small incremental steps to steer the car in the forward direction. Finally, the team refined the speed controller mechanism to accelerate, if there were no upcoming obstacles or turns in a reasonable distance from the car. “The biggest challenge we faced was in developing the controller for the autonomous vehicle. The accelerometer on the car was not robust, so we could not perform a procedure commonly called ‘system identification’ of the car. We overcame this by building a test track in our lab and developing various controllers to make the car accelerate, break and make the turns properly” (Duggirala, 2018). The team, directed by Dr. Duggirala, consisted of Abolfazl Karimi, a PhD student from the Department of Mathematics, Reynaldo Morillo, a PhD student from the Department of Computer Science, Nandan Tumu, an undergraduate student majoring in Computer Science, Manish Goyal, a PhD student in the Department of Computer Science and Engineering, and Bineet Ghosh, a PhD student in the Department of Computer Science and Engineering. The prize that was gifted for their second-place finish was a second-generation NVidia Tegra Processor, that the team will use to replace the central processor and build a next generation second version of the car. The team has plans to participate in the next competition at Embedded Systems Week in October of 2018. This 2.0 version will enable the team to perform systems identification and design better controllers for the car.